Nano sized protein skimmers can be fickle beasts. They have to remain small and affordable, but still have to function just like their more expensive, grownup counterparts. Where most nano skimmers fail to accomplish this, well at least the latter part of that statement, the Innovative Marine SkimMate certainly doesn’t. 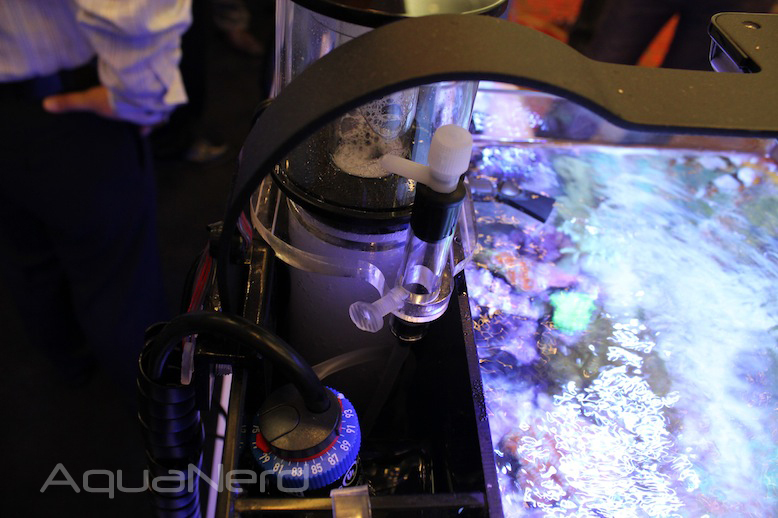 We first wrote about the SkimMate way back in a July article, and after finally getting to see it in the flesh, we can confidently say that it’s a very capable nano skimmer that goes oh so well with the IM Nuvo Aquariums. The SkimMate is offered in two different sizes, the Desktop model for tanks up to 25 gallons and the Midsize for tanks up to 65 gallons. 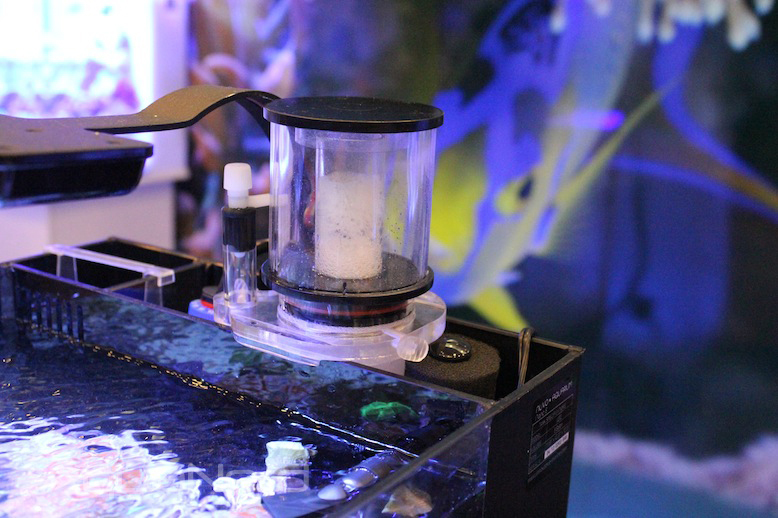 These two skimmers cover virtually ever aquarium that IM offers, the Desktop model even fits into the back of the Nano 8. That said, IM won’t officially market the skimmer for that tank because it requires extra attention to the water level in the rear chamber otherwise it won’t operate under the most ideal conditions on a constant basis, making it somewhat of a hassle to implement long term. 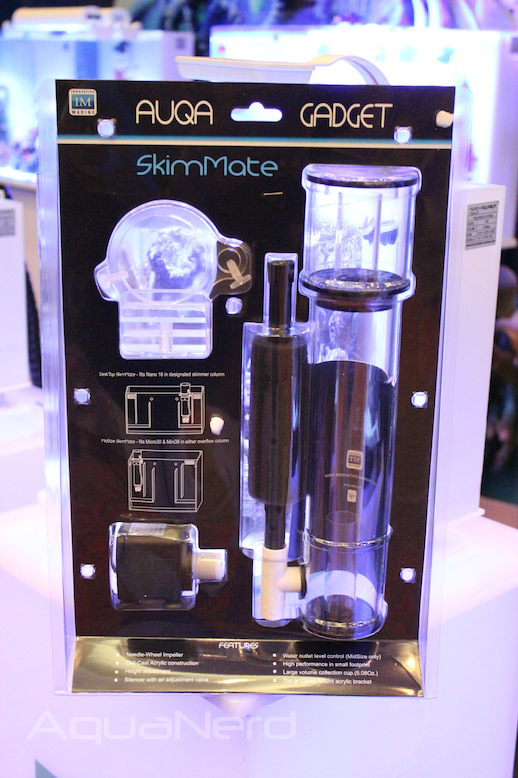 In terms of the hardware that the SkimMate has on board, both skimmer models use a 6.5watt pump that sits directly underneath the body and projects foamy water upwards. The skimmer draws in air through an adjustable valve that can fine tune both the air draw and the water level within the skimmer. After being skimmed, the foamy water exits the SkimMate through a riser tube that spills onto a piece of foam, which traps any of the microbubbles. In a nutshell, the SkimMate has all of the features of the larger protein skimmers, but they’re all tied into this tiny package that really seems to work well. Could rising sea levels be beneficial to Coral Reef Islands? 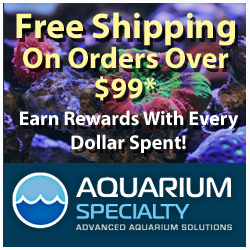 AquaNerd Exclusive! New from Seneye!! Get Your 2017 MACNA App!